This discussion is part of a broad category of tandem couplers. Tandem couplers differ from four-strip couplers (such as the Lange) in that pairs of strips are positioned far apart so that the coupling largely takes place in only two gaps as opposed to three. How can you create a 3 dB (equal split) edge coupler on a microstrip board? If you downloaded our even/odd impedance analysis spreadsheet (look in the download area) , you'd compute that for equal spit in a fifty ohm system, even mode impedance is 120.7 and the odd mode impedance is 20.7 ohms. Now think about how difficult it is to realize a 120.7 ohm line in microstrip, it would be a very skinny... then think about whether edge coupling could ever accomplish 20.7 ohms impedance. Mathematically it's possible, but you might need the gap between the lines to be 10 micro-inches (250 nanometers! ), which is not going to happen in real life. Plus, the structure would be very sensitive to strip thickness. Sorry if we just crushed your dream! Before we go on, let's point out that a Lange coupler is a 3 dB microstrip coupler that accomplishes the required even/odd impedances for equal split. Julius Lange divided the lines into multiple smaller lines to provide more than one edge to couple to. The lines and gaps on an alumina Lange coupler are on the order of 1 mil (25 microns), which is manufacturable but you will pay a premium price. You'll never see a Lange coupler on a copper printed wiring board, because tolerances on the order of one mil. But there's another way! This technique was suggested by Kevin a while ago. It turns out that you can cascade edge couplers and the coupling factor will increase. Kevin predicted that two 8.34 dB couplers could make a 3 dB coupler. We made our own version of this in ADS without thinking about it too much (a dangerous practice... We went right to microstrip stimulation (not ideal T-lines), in the example below we chose 10 mil alumina. We played around with the coupling of a single coupler, and arrived at 9 dB as a good value to cascade (we still need to post an image of the coupler by itself). Note that the network requires one termination (Term2 on the schematic) and it will require at least one RF cross-over when you lay it out. The microstip paths TL1 and TL2 have to be equal in order for the coupler to work, including the crossovers. Needless to say, there are devils in those details. The important thing is that a 9 dB edge coupler on microstrip is easy to realize because the even mode impedance is 72.5 and the odd mode is 35.5 ohms. The line width on 10 mil alumina is 7.7 mils while the gap is 2.5 mils. No worries! TL1 and TL2 are necessary to lay out the coupler. We found that the response is very sensitive to their lengths, which have to be equal. 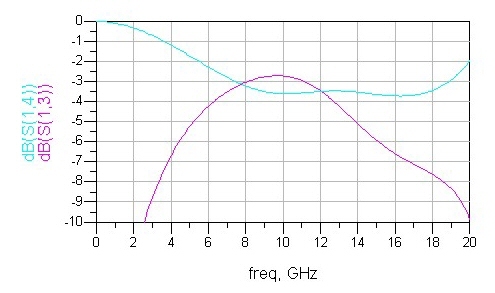 Here's the frequency response, including return loss and isolation. Note that by symmetry, all ports will have the same return loss if the rest of the ports are terminated in matched loads. Let's talk about another problem with microstrip couplers in general. The velocity that signals travel is different for even and odd modes, which degrades performance. The odd mode is faster: the thicker the metal, the worse the problem, as more of the odd-mode fields are pulled into air rather than the substrate. In the example we used 1.5 mils (38 microns), if you used 3um (in a thin-film circuit) you'd get a better response. Did your microwave professor ever point this out? In the example, the best isolation at 9 GHz is not achieved at the coupler's center frequency (10 GHz), and isolation (and directivity stink above 11 GHz, if you showed up with this coupler as shown at a design review, you would generate howls of laughter and derogatory comments. This is a microstrip disadvantage compared to stripline. If you tried this trick on stripline you'd get a much better, almost-ideal response. We'll post an example of that in the future. Here's a close-up of the direct and coupled port transmission coefficients. The coupler is over-coupled, but we look at that as a good thing because it increases the one-dB bandwidth. 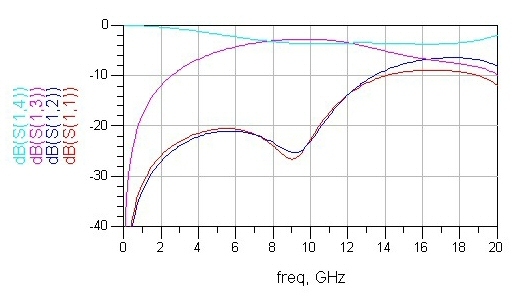 Not shown is the phase relationship between the outputs. At higher frequency, the phase starts to go out of quadrature (90 degrees) for the same reason that the isolation and directivity degrade. 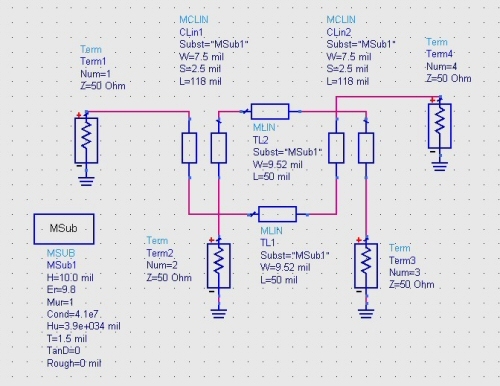 Can someone send us an image of a tandem coupler to display on this page? Thanks in advance.